Fun Link | Blog, Jane! Blog! Olive Garden Giveaway @ jayesel.net! Yeah, pinning. That’s my new thing. I think I’d rather be pinning than be reading about my high school friend’s lives on facebook. No offense, high school friends. Just so much out there. Lots of ideas. It’s kind of invigorating. I highly recommend checking out pinterest.com if you haven’t already. Leave a comment if you’d like me to send you an invitation. At Maria’s 3 year wellness checkup, the nurse gave me a bunch of papers with some good information about being 3! One of the papers was information about reading with your 3 year old and it suggested a children’s magazine being a good way to encourage reading. Plus kids love getting mail! 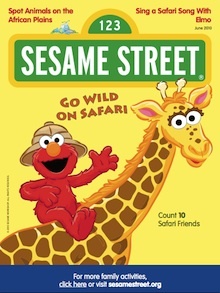 When I was little, I pretty much always had a magazine subscription starting when I was preschool age with Sesame Street magazine. (My brother got the Electric Company magazine) I loved having my very own magazine… And when I went to look it up, I discovered the magazine is not distributed via mail anymore, but electronically. And it’s free! I printed off Maria’s first copy the other night! And stapled it all together. She was so excited to have a magazine of her own that she could color in and look at! Download the latest issue here. And if you want an email when the newest one is available, sign up here! As I’m discovering the convenience and ease of Google Docs, and how easy it is to share documents with others, I’ve added a list of books that our book club has read. Hard to believe we started way back in 2001. We haven’t been terribly consistent, especially once we started to having to negotiate with husbands and babysitters! Here is the link to our book list and I’ll be adding it to my Books page as well. My disclaimer is that I have not read all these books. I found this game via Jennifer. Super fun and a great fill in for nablopomo. Answer each question and then search Flickr for each word or phrase. Choose one photo from the FIRST PAGE ONLY of your results that fits you best. Enter the photo url into the mosaic-maker. Once you’ve selected a photo for each question/answer, create the mosaic and upload it to Flickr or your blog! This is pretty funny! Aimed at the college crowd… so yeah, I’d probably even find it funnier if I was 15 years younger! Note: There is some bad language, so it may not be appropriate in all company… And being from Minnesota, I always forget that so many people have to register to vote prior to Election Day….